Immediate payment of C $1,399.99 is required. 12000 BTU Ductless AC Mini Split Air Conditioner and Heat 22 SEER Energy Star! better than name brand expensive units! Not only is this cheaper than big name super expensive units, it's actually more efficient! 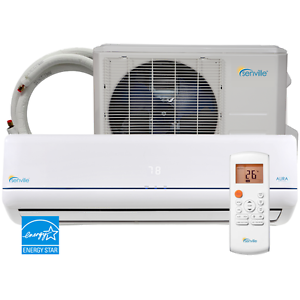 22 seer is more than the standard 16 or 18 offered by big name AC companys. the ONLY negative about this one was it said complete kit included for full set up. Well that wasn't true, it was missing a vital part, namely the wiring kit. How do you get electricity to it without a wiring kit? Well that cost me an extra bit, BUT because it's so vastly cheaper than others, the cost in the budget more than made up for that. It wasn't really noticeable. It is very quiet, in fact I still cannot hear it running. It is fancy! You would think for the price that it would be bare bones basic nothing, but the remote is part of it, and that is very nice. It's smart! If you set it for say 73 degrees it knows the temperature outside and will adjust to cool air if it's warm out and warm air if it's cold out. If you are closing in a garage or building a separate room and you are trying to decide between putting in ductwork and A/C and this ductless all in one unit...........think no more, this is the better value and the better choice. If my A/C dies, I will put these in each room before I pay for a 12,000 unit for outside ever again! Didn't take long for it to cool my upper level! Very easy to operate and quick installation from my local tech since it is well made and simple to connect. Would recommend for sure. Best investment I made in a long time. Excellent service and product. 5 stars ! I'm gonna get one more soon. It's very quiet. Works great.